All football fans across America, here’s a great deal for you! 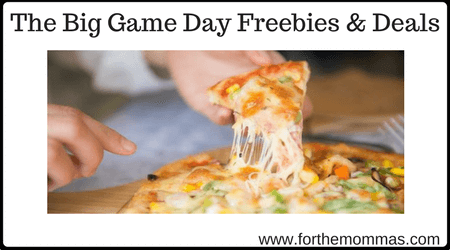 We have rounded up some great offers on your favorite restaurants plus the hottest sweepstakes and instant win games for Games Day 2019. Uber – The City of the losing team gets FREE rides home after the game for their UnHappy hour promotion, must be a reward member before the game. Bailey’s Sports Grille: Score 50 bone-in wings for $35 & Four pounds of boneless wings for $35. You must pre-order by Saturday, February 2 takeout only. Bertucci’s Restaurants: Game Day Takeout Deals on Super Bowl Sunday including Pizza & Wing combos starting at $29.99. Betty Crocker: Sign up for free coupons for game day and also future samples. Cici’s Pizza: is celebrating the Big Game with a special To-Go offer of 3 medium, 1-topping pizzas for $12. Good only on Super Bowl Sunday. Chipotle – Free extras on any burrito with postmates. Corner Bakery Cafe: 20% off an online $100 catering order with a coupon good today through Super Bowl Sunday. El Pollo Loco: Free Fire-Grilled Chicken Nachos with a family meal purchase on Super Bowl Sunday. Fox & Hound Sports Tavern: Premium seating with an endless buffet for $25 on Super Bowl Sunday. GrubHub: Take $10 off $15 delivery for the big game at a restaurant of your choice. Hardee’s: Free sausage biscuit if a Pick 6 happens during the Super Bowl! Valid Friday, Feb. 8th from 7-10am. Hickory Tavern: Reserve your tailgate packages for Super Bowl before Friday 2/1 and save 10%! Marie Callender’s: has whole pies for just $7.99. Pizza Hut: Get a large 2-topping pizza for only $7.99. Online orders only. Red Lobster: 10% off online takeout orders with code LOBSTER65 through February 3. Spaghetti Warehouse: 20% off online takeout orders through March 4, 2019. Sports Illustrated Magazine: Free subscription to Sports Illustrated or Sports Illustrated Kids Magazines after signup survey. Texas de Brazil: 20% off dine-in or takeout orders on Super Bowl Sunday. Tijuana Flats: Free Burro Bash with a catering order for 20 or more people on Super Bowl Sunday. Ask for “the Big Game Special ” to get the offer. White Castle: Get 20 Original Sliders for $10. Good for online and app orders only. Whole Foods: Ready-to-serve chicken wings for $4.99 a pound. Good through Tuesday, February 5, 2019. Wienerschnitzel: Get 25 mini corn dogs for just $5 on Super Bowl Sunday. Limit 4 per customer. Sweepstakes – enter now to win Football Tickets, NFL Gift Cards and more!